Avoid taking the canal cruise during the middle of the day in Summer, the glass boat gets very warm inside. We are comparing Canal Cruise and Heineken Experience Combo Ticket Prices from leading ticket suppliers and Try to find you Cheap tickets prices on the market. the Heineken experience is an interactive, self-guided tour through the former Heineken brewery that shares the history of the brand and some of the secrets of this lager\'s success from the brewing and bottling process through to the marketing campaign. Heineken lager is Amsterdam\'s most popular exported product. Amsterdam\'s canals are UNESCO World Heritage listed, the banks lined with beautifully 16th and 17th century architecture. through audio commentary you\'ll learn the history of the city of Amsterdam right back to Medieval times. Great if you like interactive experiences and learning plus sightseeing. Save money and time with the combi ticket that gets you into not 1 but 2 of Amsterdam\'s top touristic attractions. If you have booked to do the canal cruise separately you won\'t benefit from this combi ticket as it\'s the same sightseeing canal cruise. Your Experience With Canal Cruise and Heineken Experience Combo Ticket? 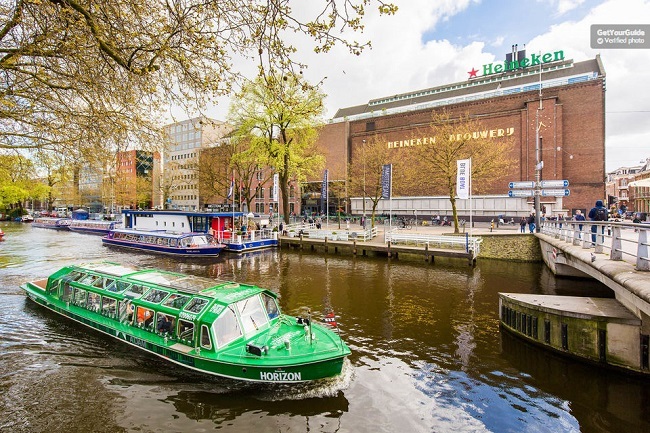 Choose if you want to take the canal cruise first or if you\'ll do the Heineken Experience first, bearing in mind that the cruise can be taken at any time of the day (or night) but that there is timed entry to the Heineken experience. You\'ll get fast track entry into the Heineken experience with your pre-booked tickets allowing you to skip the queue for the ticket office and glide on through at the allocated time. You\'ll learn all about the brewing and bottling process of Heineken lager plus how it is/was marketed as you move around the interactive self-guided museum experience in the former Heineken factory, the tour taking approximately 90 minutes to complete. At the end of the tour you can go to the on site bar and enjoy 2 free glasses of larger or a soft drink instead. the Canal Cruise is a separate tour that can be taken at any time of the day. Lasting 75 minutes the cruise with audio commentary takes you through the hip and happening De Pijp area of the city. You\'ll cruise past old merchant houses and under picturesque bridges learning all about Amsterdam on the journey. What Canal Cruise and Heineken Experience Combo Ticket Includes? Fast track entrance ticket to the Heineken Experience with a free lager or soft drink at the on site bar. 75 minute canal sightseeing cruise with multilingual audio commentary in English, Dutch, French, German, Spanish, Italian, Portuguese, Polish, Russian, Chinese, Japanese, thai, Turkish, Indonesian, Korean, Hindi, Hebrew, and Arabic. If booking through GetYourGuide or Viator you also get free entrance to the Holland Casino. Note that the two experiences are independent of each other. Don\'t sit at the back of the boat, it can get noisy due to the engines. Travelers Reviews about Canal Cruise and Heineken Experience Combo Ticket? Travellers talking about this tour on GetYourGuide, Viator, Tiqets, and TripAdvisor give it high ratings and good reviews. they say they had a good time at both attractions despite them being entirely different from each other and learnt a lot at both too, people tending to prefer the Heineken Experience a little more than the cruise... But when there\'s free lager involved what can you expect?!! the Heineken tour is recommended even by people who aren\'t typically interested in breweries and dislike lager thanks to the fun interactive displays at the museum/brewery experience to keep you entertained whilst also learning. the canal cruise receives good reviews but some people said that the commentary was outdated and not always working correctly – i.e. sound only playing from one headphone, a few other people were disappointed that the did not see as much of the city as they expected to on the cruise but others were thrilled with how much they saw from the water so it\'s best to go not having too many expectations then they can\'t be dashed! Printed tickets and e-tickets are accepted – Make sure the barcode is included as this will be scanned at the Heineken experience. Note that the timed entry is for the Heineken Experience – Be at the entrance 15 minutes before your listed time. the canal boat ride can be taken at any operational time during the day that your tour is booked for. The Heineken Experience is at Stadhouderskade 78. the Canal Cruise is opposite here.